Halifax to Ingonish Ferry N.S. How the herd does grow. When your parrots get bored. Submarine Life or Living in a sewer pipe. Farm ponds do not require upkeep, right? Even bad drawings are probably worth more than words. You didn’t come here for an Art lesson so lets get to the terms. This picture is typical of the locale I live in now. The Houston area and probably most of the Gulf Coast. I’m sure that someone had a very good reason for starting to build houses like this. Probably it came about for two reasons. The south is the world of air conditioning. You want those ducts to come off the plenum and point the cold air downwards. Cold air will fall and mix which is what you want. The second reason would be to conserve space. I think conserving space is a canard. My reasons come later. Something I do know is that I never saw a furnace in a crawl space under a home down here. It would be great in winter but the water table is very fickle and because of that we have few basements. A basement is a problem to seal. More on furnaces later. 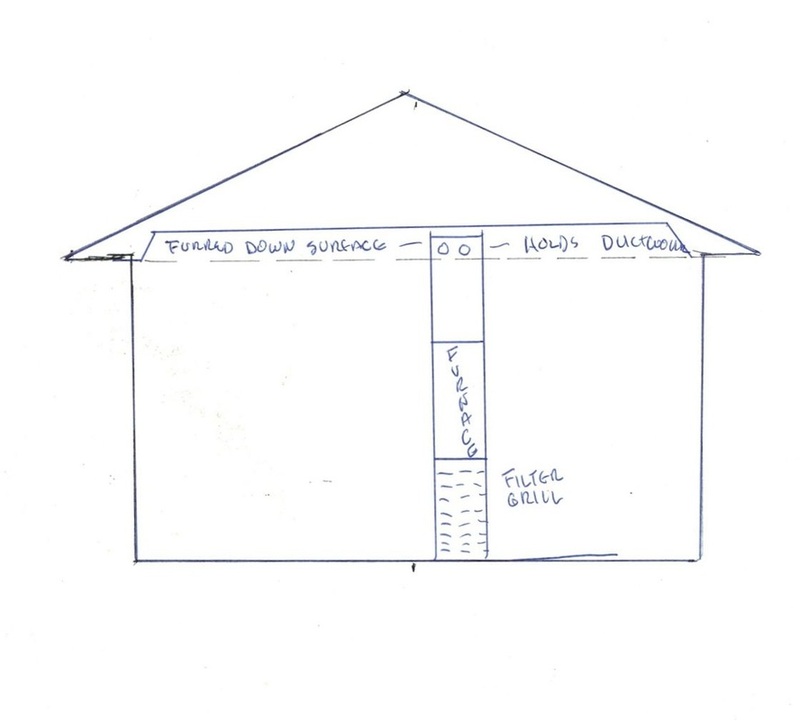 The scratches under the furnace and above the ceiling in the drawing represent attic insulation. Very necessary stuff. If you have big gaps in the insulation it probably results in noticeable hot spots in the home. The most common type is the pink roll which is fiberglass and probably made by the pink panther folks. Fiberglass is not necessarily the best because it does shrink over time and many people are allergic to it. I believe that what we have here is known as rock wool. I certainly cannot talk about strong or weak points between the brands or really, the types. The R factor is all that matters and it is plainly printed on the roll. This batt insulation has an available paper backing that serves as a vapor barrier on the conditioned side. Thats the bottom for the ceiling rolls and inwards for rolls in exterior walls. Should you want to add more insulation you must not use another roll with a vapor barrier. Having two vapor barriers with insulation between deteriorates the insulation. There are also batts available that are sold without vapor barriers. My personal choice would be to add blown in insulation if I wanted to increase my efficiency. This is blown in insulation. It is either ground cellulose (old newspapers and magazines) or rock wool. This appears to me to be rock wool. 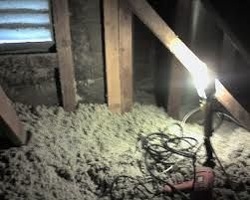 I have installed this type insulation and the customers always seem to be happy. The only problem I have run across happens 15-20 years down the road. There is a fine dust that seems to come from everywhere and blankets the inside of your home. You must make boxes to cover electrical connections ahead of time because it fills all it encounters. My guess would be that the small hose here provides glue. I have seen this done and it seems to work well. Obviously something is making it stick to the wall and that is an improvement since I was deeply involved. Your vapor barrier here could easily be plastic but more than likely there will not be one. With ventilation I have never seen that to matter. Your ancestors knew the insulative value of cellulose. Many old homes used newspaper. To avoid converting the home to a tinder box you soaked the paper in borax and let it dry on the clothesline overnight. I imagine a home inspector would go into spasms if they ran across it today. My parents lived through what was known as the dirty thirties and my dad has wrecked homes that were that old. The dust from that period is still in many attics combined with old newspapers. It is pretty good at insulating but messy to remove. Today, my personal favorite is the newest version of foam insulation. This stuff can be put directly on the under part of the roof with certain caveats. I did some work for a church camp and we did that. It certainly filled the need for attic insulation. We used the attic instead of the intake chase you see in the drawing. In other words the units used the attic as the return air plenum. It also reduced the need for air conditioning greatly. We sized the air conditioning to include the need to cool 50 kids at lunchtime.Had I known they were going to take my recommendation on the insulation, I would have installed smaller units. Caveat: Insulation does not stop heat. It just slows it down. Also, when done on the ceiling it does nothing to reduce the killer heat in the attic. Your AC must work in that heat. Furnace: In a modern system the furnace provides a multi speed fan motor for the air conditioner as well. In the south it is frequently found just like the drawing at the top. It provides cool air through the ducts that can then fall when it is released. Picture number 2 shows a different concept. Put the furnace in the chase. It is just a big open air closet anyway and there is no need for insulation. Give it a door and the repairman will thank you when he avoids the attic. This particular installation type also keeps raccoons from tearing up your duct because the ducts are covered and insulated. It is called a furred down system. They can be built under the ceiling just as well. I have seen both ways. This picture provides a better answer. The only caveat is that the ducts had better be right when you start because going back is tough. What you actually normally see in a "closet unit" that has the unit in the closet but the plenum and ducts sticking into the attic and above the insulation. That is not furred dow. It is still an improvement because the furnace and coil are in a conditioned space. 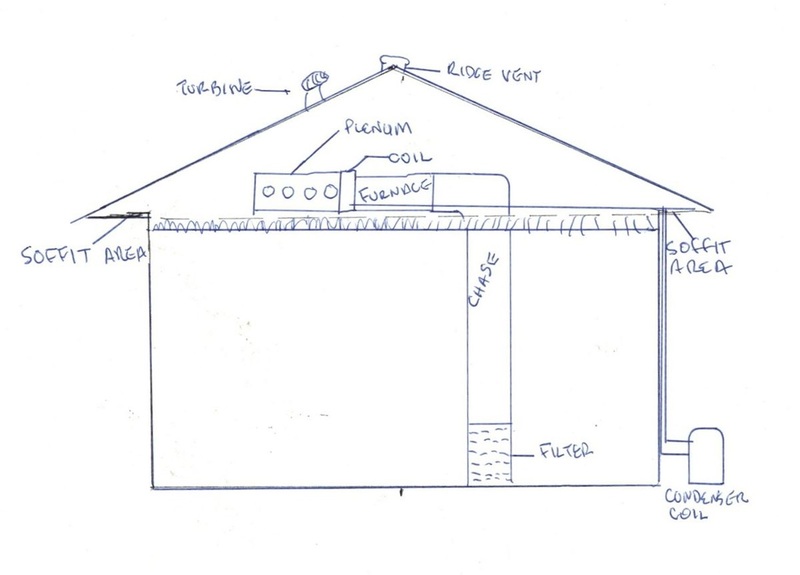 Would you rather run your conditioned air through an unconditioned attic or through a conditioned space. Which do you think will be more efficient. Choose wisely or pay later. Aids to cooling and heating.